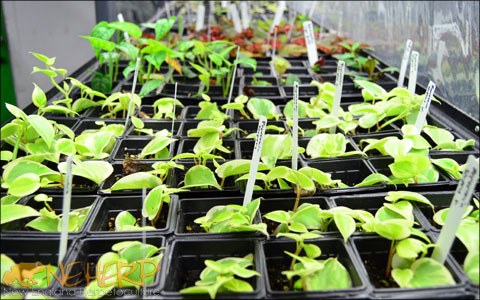 Live Peperomia Plants For Terrariums & Vivariums | NEHERP - Your One Stop Vivarium Shop! 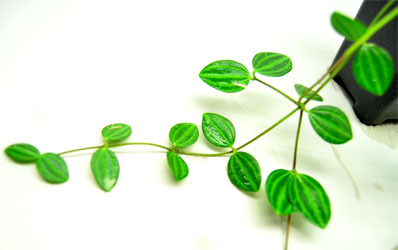 Peperomia is a widely distributed tropical & subtropical genre of plants thought to contain over 1400 different species. 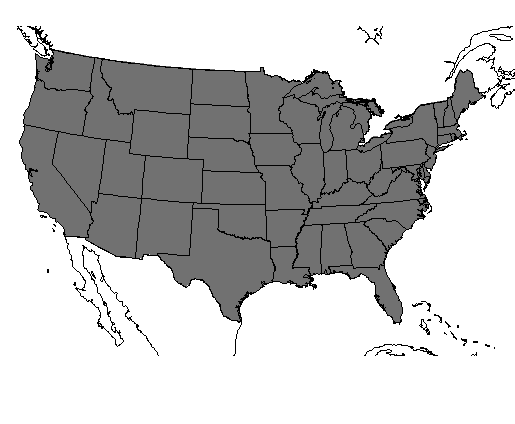 The majority of these can be found in tropical America, although a limited number also grow in Africa, Australia, Madagascar, and the Philippines. One of the things that makes Peperomia easily identifiable is their flower spikes, illustrated in a couple of the photos above. 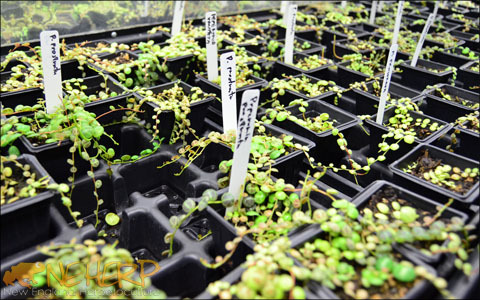 The majority of these are fairly small, and many of the types we work with can can be grown epiphytically. We consider Peperomia plants an especially versatile, easy, and rewarding choice for use in an enclosed terrarium environment. 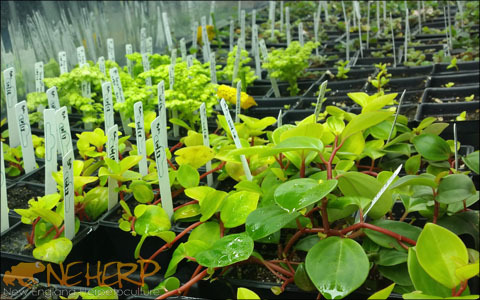 We've been working with Peperomia since we opened for business, and they are some of our favorite plants to grow. While a few varieties we work with can be grown as a houseplant, the majority of the plants in our lineup are best housed in a terrarium. Their flexible growing habits and potential to be grown epiphytically (usually) mean some of these species will do equally well planted terrestrially or mounted to a custom background. 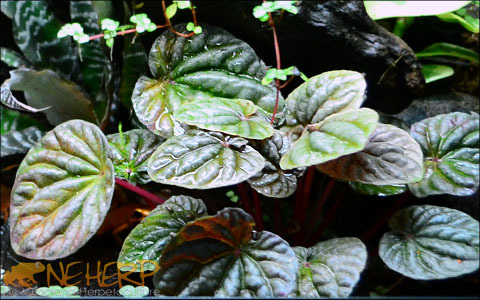 With reasonable lighting requirements and their forgiving nature, Peperomia are an awesome choice for anyone designing a tropical or subtropical live vivarium environment. Our collection of these grows every year, and are always looking to acquire new & exciting varieties for our lineup. 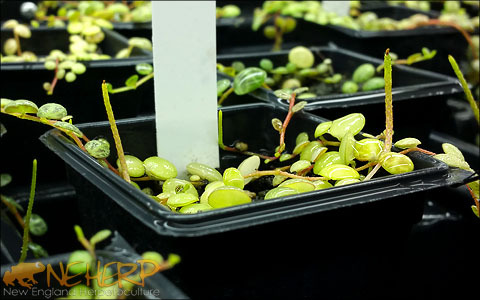 We grow our Peperomia under either custom LEDs or basic T5HO grow lights depending on the species. 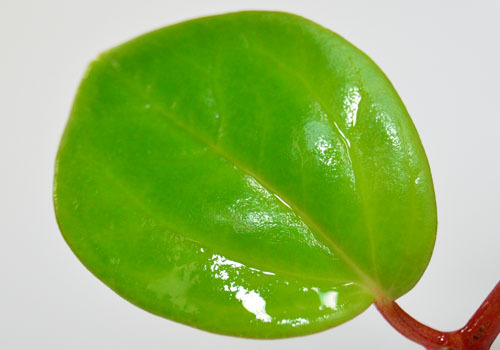 For reference, the PAR rating of our Peperomia growing areas ranges from 45-95µMol/M²S at plant level, depending on the species. We maintain relative humidity between 65-75%, keep temperatures between 68-85F, and utilize automated misting & watering cycles whenever we can. Although they can be grown epiphytically, the majority of ours are simply grown in our specially mixed organic potting soil. The available plants are raised in the mild potting soil and ship before they require additional nutrients, but the mother plant stock we propagate from are fed using extremely mild, balanced, organic nutrients every 2-3 months. That same regimen would likely be a good starting place for your new plants, if you don't plan on keeping them in a vivarium. (No additional fertilization should be required in a viv!) 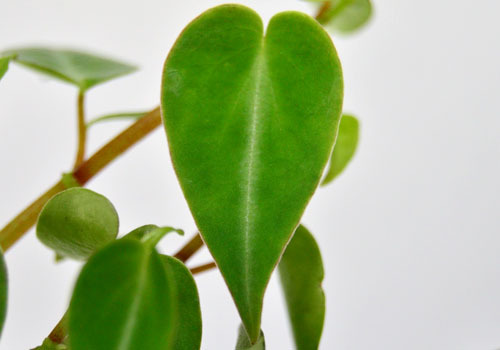 We're proud of the Peperomia we grow, and we're confident you'll love the plants you receive! 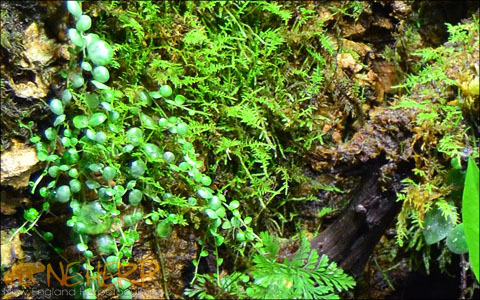 In a vivarium, we'd recommend either mounting these epiphytically using a Plant Mounting Kit, or simply planting them terrestrially using a Vivarium Base Kit. Any of our Vivarium Lighting Kits would work with these plants, with the LED options performing best. So long as the plants are added to an enclosure built to the specifications described in Vivarium Construction 101 & 102, maintenance should be fairly straightforward & limited with the majority of the plants we carry. Every individual plant below has more specific info to check out, so scroll down to see what we'd recommend! This plant's leaves resemble watermelons, and can grow up to 3.5in across. The stems & petioles are bright red, and boldly contrast against the plants variegated green leaves. Care is straightforward as a houseplant and in a terrarium environment. 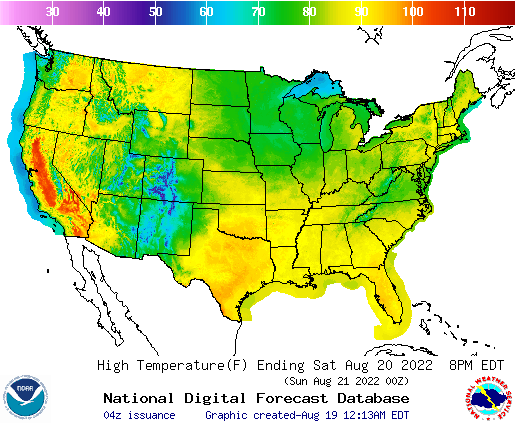 A fairly wide range of conditions are tolerated in either case, although higher humidity is best. We don't have any of this plant ready to ship immediately, but we're expecting some to grow out soon. If ordered today, we'll reserve the first (and usually largest) plants from the batch, and you can expect it to ship within 7-12 business days. Please do not purchase this plant if you'd rather not work around this longer processing schedule. This plant's leaves have a rippling texture, and can grow up to 2.25in across. The 'Emerald Green' variety's round leaves are an attractive green color which seems to deepen with age. Care is straightforward as a houseplant and in a terrarium environment. A fairly wide range of conditions are tolerated in either case, although higher humidity is best. This plant's leaves have a rippling texture, and can grow up to 2.25in across. The 'Luna Red' variety's leaves range from dark purple to a deeper red. Care is straightforward as a houseplant and in a terrarium environment. 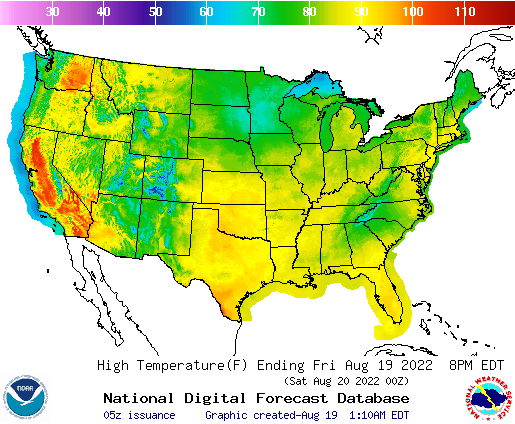 A fairly wide range of conditions are tolerated in either case, although higher humidity is best. This common, colorful cultivar thrives as a houseplant and in a terrarium environment. It's leaves are variegated with green centers fading to cream & pink edges, and the coloration seems to become bolder in ideal conditions. 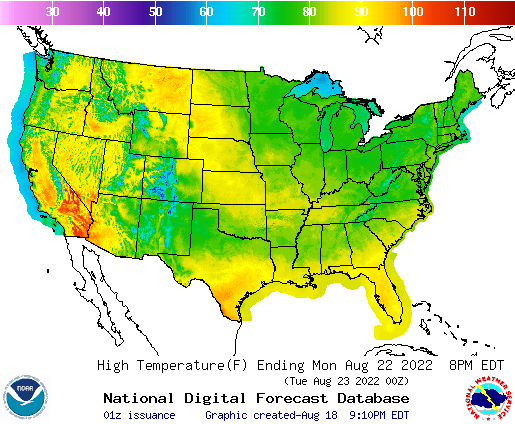 A fairly wide range of conditions are tolerated in either case, although higher humidity is best. 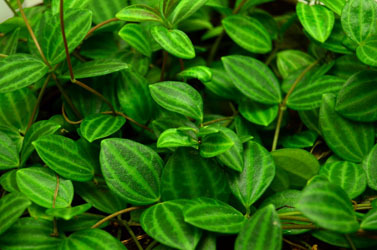 Peperomia cubensis features round green leaves, and grows in a trailing pattern. 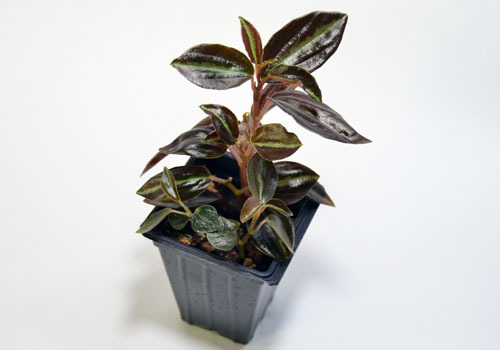 It's relatively new to us, so our recommendations for growing it as a houseplant are limited. In a terrarium environment, it does best when mounted up high & allowed to trail downward. It stays around 4-6in high before beginning to hang & spread downward. 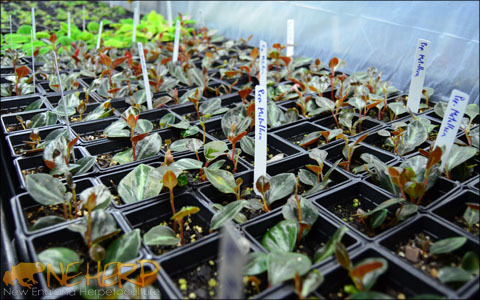 Easy to propagate & easy to grow. 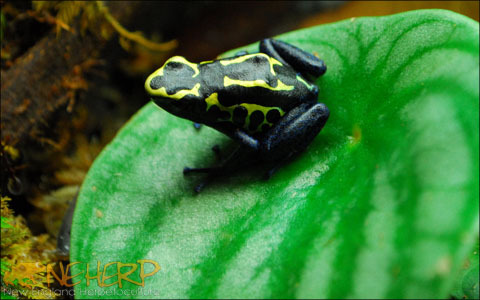 This is a fairly uncommon species which we only have available in small quantities. 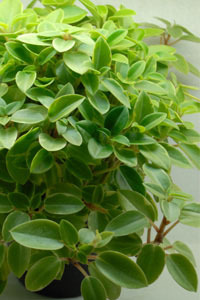 Peperomia eburnea features ovate green leaves, and will grow easily in either a trailing or scandent pattern. 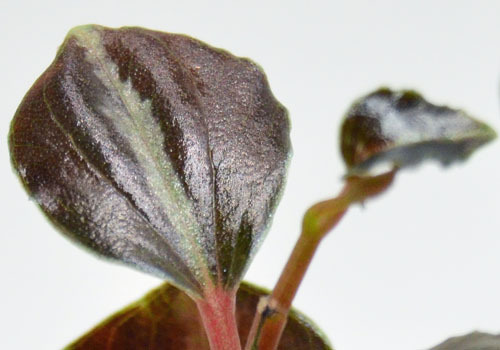 The leaves feature visible white vein structure, with the color variance growing deeper in higher PAR conditions. This species can be grown epiphytically in a humid environment if it's kept on a reasonably moist surface. We have not yet attempted to grow this plant as a "houseplant", and have only kept them in enclosed environments. 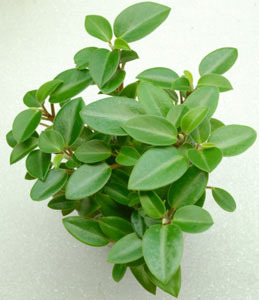 In a terrarium, Peperomia eburnea does best when mounted up high & allowed to trail downward. It stays around 3-4in high before beginning to hang & spread downward. This species has attractive green rounded leaves spaced along reddish brown stems. 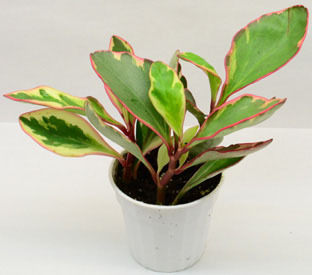 As a houseplant, care is fairly straightforward by providing ample light and moisture. In a terrarium, this species is very easy to care for, and can be a planted either terrestrially or epiphytically in higher humidity. 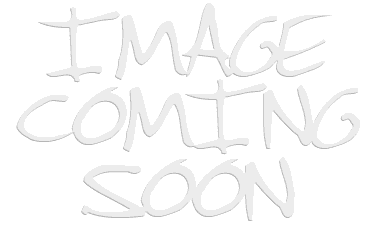 Overall, this plant grows in a vining/trailing habit, and tolerates a wide variety of conditions. Expect To Trim Bi-Monthly Terrestrial Or Epiphytic / Versatile & forgiving! 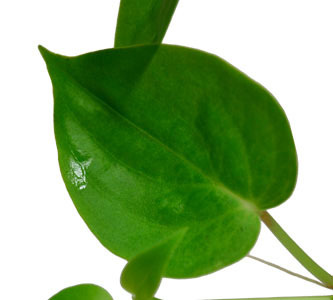 The rounded leaves of this hanging Peperomia are only around 1/2in across. It's a forgiving plant which can be grown as a houseplant or in a terrarium environment. As a houseplant, this will do best in a hanging pot or basket. In an enclosure, we recommend planting up higher on a background and allowing it grow in a trailing pattern. 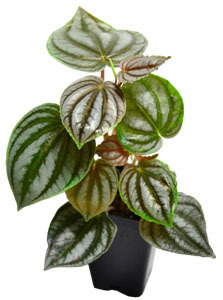 This terrestrial Peperomia has dark rounded leaves patterned with metallic silver markings. It's stems have a cool red hue which makes the plant stand out even more. It's a terrestrial grower, and will tolerate life as a houseplant when planted with moist soil and kept in partial shade to filtered sun. It's especially forgiving in a terrarium, where it will slowly grow upward to 6-8in tall & grow outward with time. Does well in high humidity, so long as it's not in overly-wet conditions. Easy to grow, propagate, and trim as necessary. 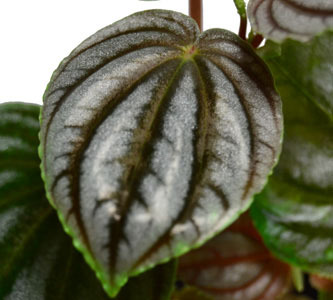 This terrestrial-growing Peperomia has dark elliptic leaves patterned with metallic green markings. The leaves are a bit smaller, more narrow, and have a brighter green coloration than the more common 'Columbiana' cultivar. We haven't had the chance to grow this as a houseplant, but assume it'll do well with the same care we've used for the more common variety. (Partial shade to filtered sun & keep soil moist) In a terrarium this plant grows upward of 6-8in tall and spreads outward with time. It does well in high humidity, so long as it's not in overly-wet conditions. 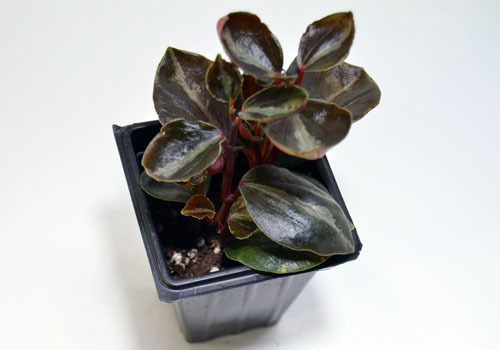 We purchased this plant as Peperomia metallica 'Ecuador' back in 2018, but here seems to be a few names floating around for what seems to be this same cultivar. (We suspect the 'Narrow Leaf' form may be the same!) If you've got concrete info with regard to the cultivar name of this plant, please let us know. We're eager to learn more! 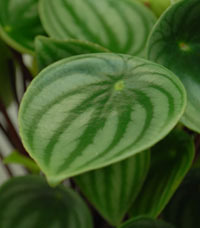 Obtusifolia is one of the most common Peperomia species on the market. 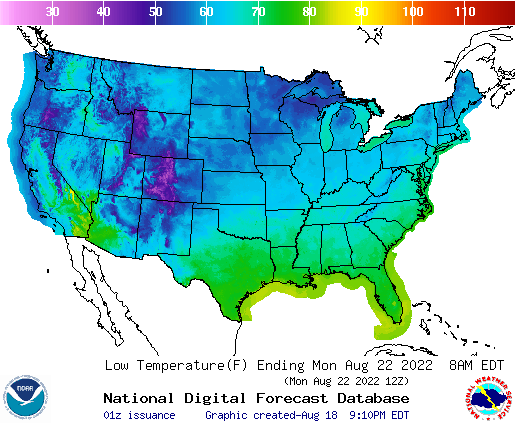 It's relatively small growth pattern and forgiving nature make it an awesome choice for a wide variety of conditions. 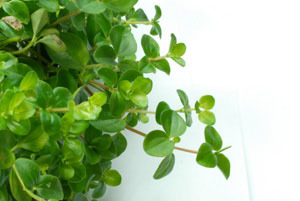 This is the natural variety with green spoon shaped leaves. 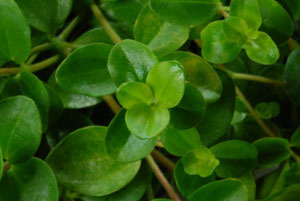 Obtusifolia is one of the most common Peperomia species on the market. It's relatively small growth pattern and forgiving nature make it an awesome choice for a wide variety of conditions. We work with two variegated cultivars of this common plant, and we've seen this variety called either Obtusifolia variegata or Obtusifolia 'Albo Marginata'. This cultivar has attractive white & green variegation on it's leaves. 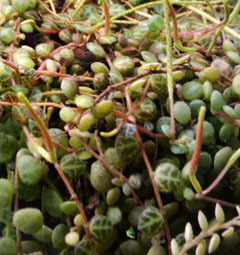 Obtusifolia is one of the most common Peperomia species on the market. It's relatively small growth pattern and forgiving nature make it an awesome choice for a wide variety of conditions. We work with two variegated varieties of this species, and we've heard this type called either Obtusifolia variegata or Obtusifolia 'Marble'. Whatever you call it, it's variegated pattern has a smoother gradient and more green coloration than the other type we work with. 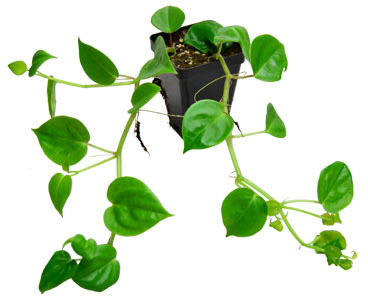 A bushy-growing species of Peperomia which requires high humidity and fairly well draining soil to thrive. The ovular slightly hairy leaves typically grow to 1in or smaller, and the plant is a fairly quick grower overall. 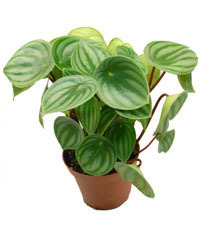 As a houseplant, Peperomia orba does especially well planted in a hanging basket/pot. In an enclosure, this plant is easiest to grow terrestrially, but can also be mounted epiphytically with a little extra effort. So long as it's roots don't stay too wet, this species is fairly forgiving. 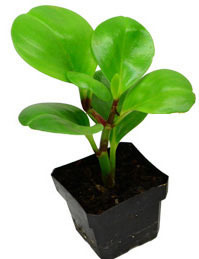 A bushy-growing species of Peperomia which requires high humidity and fairly well draining soil to thrive. This is the variegated cultivar with white & green coloration on the ovoid leaves. Each leaf typically grows to 1in or smaller, and the plant is a fairly quick grower overall. 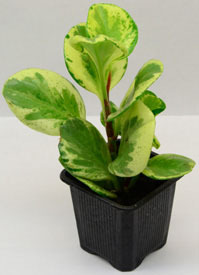 As a houseplant, Peperomia orba 'Variegata' does especially well planted in a hanging basket/pot. In an enclosure, this plant is easiest to grow terrestrially, but can also be mounted epiphytically with a little extra effort. So long as it's roots don't stay too wet, this species is fairly forgiving. 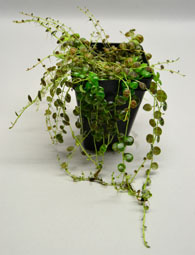 This is one of the more sought-after Peperomia species in the live vivarium hobby. It's native to tropical South America, and it's delicate trailing pattern makes it an excellent vivarium plant. The tiny (~1/8-3/8in) leaves of this species have awesome patterns with colors which brighten or fade depending on the conditions. In our experience higher amounts of PAR (75+µMol/M²S) in higher humidity (75% R/H) allows the plant to present with it's boldest coloration & quickest growth. 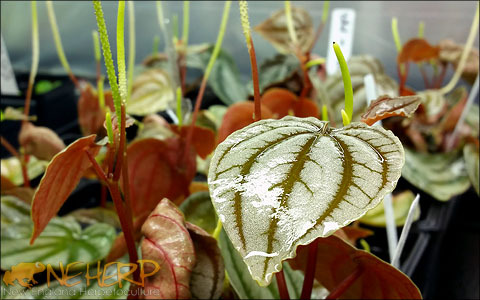 As a houseplant kept in a hanging basket or pot, it's higher humidity requirements can require a little extra care (misting) than some of our other Peperomia. 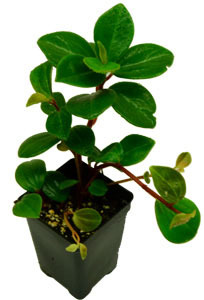 This is one of the more difficult of the usually easy to grow Peperomia species we offer, and isn't available often. Does best when planted up high and is allowed to hang & trail downward. Tolerates low to moderate amounts of light, and does best with moist soil. 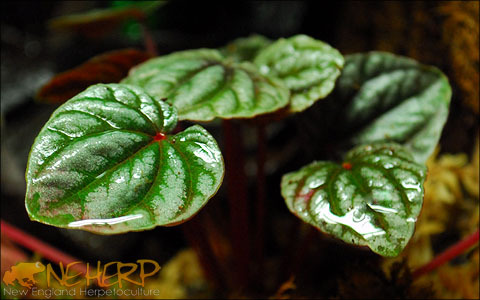 Native to tropical South America, the bright red trailing stems & detailed leaves of this trailing Peperomia make it an excellent vivarium plant. Leaves develop symmetrically up the long stem, which grows in an upward habit before it begins to trail. It's forgiving as a houseplant, and is most commonly grown in hanging baskets/pots. In an enclosure, it can be trained to grow up decor and will throw roots onto it's surroundings in humid and moist environments. 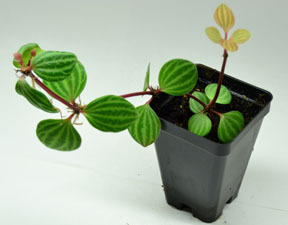 A creeping/trailing species of Peperomia with striped oblong leaves which grow symmetrically along the stems. As a houseplant, this one can thrive planted in a hanging basket/pot. 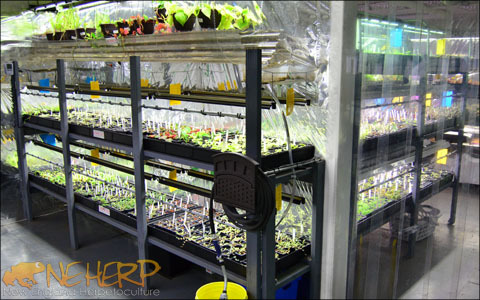 In an enclosure, the plant is equally at home growing in substrate or mounted epiphytically. Tolerates low to moderate amounts of light, and thrives with plenty of humidity. Leaves grow to be about 1in long. 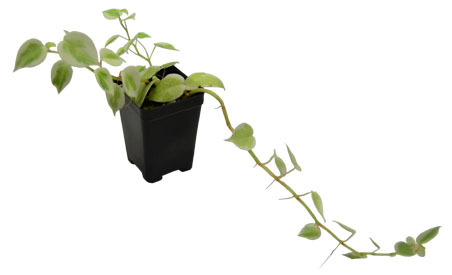 Peperomia serpens is an easy & popular choice for anyone looking for a great looking trailing plant. As a houseplant, it does well planted in a well-draining hanging basket/pot. In an enclosure, it can can be planted low to grow up a background, or planted high to trail downward. Tolerates a wide variety of conditions, and is considered an excellent plant for enthusiasts of any experience level. Does best with a well draining soil that's allowed to dry slightly between watering. 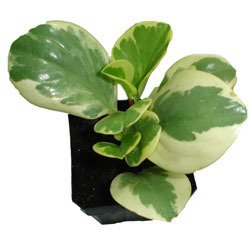 This is the variegated (cream + green) colored version of the always-popular Peperomia serpens plant. As a houseplant, it does well planted in a well-draining hanging basket/pot. In an enclosure, it can can be planted low to grow up a background, or planted high to trail downward. Tolerates a wide variety of conditions, and is considered an excellent plant for enthusiasts of any experience level. Does best with a well draining soil that's allowed to dry slightly between watering. 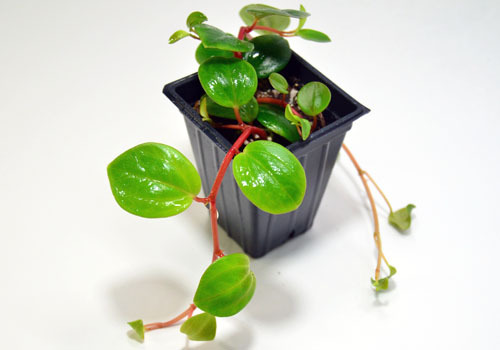 Peperomia turboensis is a real beauty, and is a less-than-common species. While growing this as a houseplant is totally possible, it's most commonly kept in some type of humid enclosure. 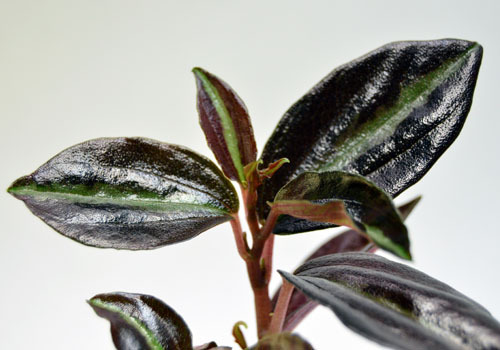 With a metallic sheen on every leaf and a compact growth pattern, this humidity-loving plant couldn't be more well suited to live in a live vivarium. Tolerates a wide range of conditions, but the deeper colors will appear when grown under higher humidity & fair levels of PAR light (50µMol/M²S+). Does best with a well draining soil that's allowed to dry slightly between watering. We've got a bunch growing out now which should be available soon! 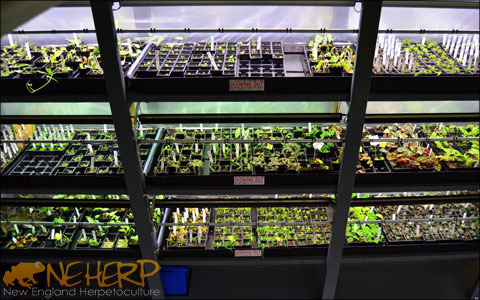 Only a small fraction of the plants we grow are available at any given time. The majority of plants we sell are shipped in our discounted Vivarium Plant Packs, and we often reserve "low availability" plants for those kits.